Royal Dutch Shell has filed a criminal complaint against a former senior employee over suspected bribes in the 2011 sale of an oilfield in Nigeria. Dutch prosecutors confirmed they had received the complaint against Peter Robinson, a former vice president for sub-Saharan Africa. This comes at a time when the multinational oil and gas company and several former executives are already facing a criminal trial in Milan over an alleged bribery scheme related to the separate purchase of a Nigerian oil block. New-born babies are considered to be a blessing and their arrival is widely celebrated. But in some parts of Nigeria, babies from multiple births like twins, are considered evil. Here is more on this shocking trend. Nigeria's government says its negotiating ceasefire with jihadist group, Boko Haram. It's the first time the government has publically admitted to negotiating a peaceful end to nearly ten years of conflict. Previous talks with the group have been focused on the release of hostages. In Nigeria ceasefire talks are reportedly under way between government and Boko Haram militants. That's according to information minister Lai Mohammed. Boko Haram has killed thousands of people in the country during an insurgency that's lasted for years now. Borno state, Nigeria's north east state hardest hit by the 9 year old Boko Haram insurgency has ordered indefinite suspension of boarding schools. The call comes in the wake of increasing threats more abduction threats.The directive by the state government only allows boarding school within the state capital to remain open. More than 100 Nigerian schoolgirls, most of those recently kidnapped by Boko Haram, have gone home to their families, four days after being freed. The jihadist group abducted the girls from the town of Dapchi in February. After their release from captivity and a brief emotional meeting with their parents, the schoolgirls were flown to the capital to meet the president. As well as meeting President Muhammadu Buhari, the newly-released girls underwent medical and security screenings. The schoolgirls, who were kidnapped from their boarding school on 19 February, were reportedly released by the side of a road almost five weeks later. A total of 110 girls were originally kidnapped, but five did not survive the ordeal and one other - a Christian who refused to convert to Islam - is still being held. "The Buhari administration will not relent in efforts to bring [her] safely back home to her parents," a statement said. Two other people - a boy and another girl from Dapchi - were freed at the same time, officials also said. The government denies claims that Boko Haram was paid a ransom for the girls' freedom, or that there was a prisoner swap. Information Minister Lai Mohammad told the BBC's Focus on Africa that the girls' return was part of ongoing talks about an amnesty in return for a ceasefire. After being reunited with their families, the schoolgirls from Dapchi village, have now arrived in the capital, Abuja. The girls are due to meet President Muhammadu Buhari. 110 girls were kidnapped over a month ago, during a raid by militants in northeast Nigeria. The girls, though, say five of them died in captivity. In an extraordinary turn of events, fighters of Boko Haram surrendered the girls to the community on Wednesday. Nigeria's Minister of Information has denied suggestions that a ransom was paid to secure the girls' freedom. In Nigeria the petroleum ministry is walking back on a 2019 deadline it set to end costly importation of refined fuel. The ministry has long complained of a lack of funds to repair domestic refineries. Nigeria is Africa's biggest exporter of crude oil but lacks the capacity to refine its own fuel and its economy often suffers from crippling fuel shortages. More than half of a group of schoolgirls kidnapped last month in Nigeria by the terror group Boko Haram have been released and returned to their hometown of Dapchi, a Nigerian minister said Wednesday. Seventy-six of the 110 schoolgirls whom militants abducted from their boarding school on February 19 were "dropped off" early Wednesday in Dapchi in northeast Nigeria, the country's minister of information and culture, Alhaji Lai Mohammed, said in a statement. The release of the students was ongoing, and the number of freed girls will be updated after the remaining ones are documented, the statement said. Boko Haram fighters abducted the 110 girls from the Government Girls Science and Technical College in Dapchi on February 19. In the statement, the information and culture minister said the 76 students had been released following "back channel efforts" by the government. The minister said the release was unconditional. "The government had a clear understanding that violence and confrontation would not be the way out as it could endanger the lives of the girls," he said in the statement. Kachalla Bukar, the secretary of the missing girls parents' association, told CNN the girls were seen walking into Dapchi at about 7:30 a.m. local time. Bukar said he saw around 50 of the girls but had not seen his 14-year-old daughter, Aisha, who also was captured in last month's raid. "The girls said Boko Haram dropped them about 20 kilometers into Dapchi town and told them to find their way," he said. "... Parents are rejoicing here, but we can see they have suffered." Parents were heading into town for a head count and confirmation of numbers, Bukar said. Nigerian President Muhammadu Buhari has described the kidnappings in Dapchi as a "national disaster" and deployed troops and surveillance aircraft in search of the missing students. "Let me assure that our gallant armed forces will locate and safely return all the missing girls,"Buhari said in a statement on Twitter in February. According to the report, at least five phone calls were allegedly made to the army and police on the afternoon of the attack, warning the Boko Haram militants were on their way to the school. "The Nigerian authorities must investigate the inexcusable security lapses that allowed this abduction to take place without any tangible attempt to prevent it," said Osai Ojigho, Amnesty International's Nigeria Director. Nigerian army spokesman John Agim told CNN the allegations weren't true and the army had not been informed. Nigeria's military was on Tuesday accused of ignoring repeated warnings about the movements of Boko Haram fighters before they kidnapped 110 schoolgirls in the country's restive northeast. The students -- the youngest of whom is aged just 10 -- were seized from the town of Dapchi, Yobe state, on February 19 in virtually identical circumstances to those in Chibok in 2014. Then, more than 200 schoolgirls were taken in an attack that brought sustained world attention on the Islamist insurgency and sparked a global campaign for their release. President Muhammadu Buhari has called the Dapchi abduction a "national disaster" and vowed to use negotiation rather than force to secure their release. But as in Chibok nearly four years ago, human rights group Amnesty International claimed the military was warned about the arrival of the heavily-armed jihadists -- yet failed to act. In the hours that followed both attacks, the authorities also tried to claim the girls had not been abducted. Amnesty's Nigeria director Osa Ojigho said "no lessons appear to have been learned" from Chibok and called for an immediate probe into what she called "inexcusable security lapses". "The government's failure in this incident must be investigated and the findings made public -- and it is absolutely crucial that any investigation focuses on the root causes," she added. "Why were insufficient troops available? Why was it decided to withdraw troops? What measures have the government taken to protect schools in northeast Nigeria? "And what procedures are supposed to be followed in response to an attempted abduction?" There was no immediate response from the Nigerian military when contacted by AFP. Amnesty said that between 2:00 pm and 6:00 pm on February 19, at least five calls were made to tell the security services that Islamist fighters were in the Dapchi area. Locals spotted about 50 members of the Islamic State group affiliate in a convoy of nine vehicles in Futchimiram, about 30 kilometres (19 miles) from Dapchi, then at Gumsa. In Gumsa, where Boko Haram stayed until about 5:00 pm, residents phoned ahead to Dapchi to warn them. The convoy arrived at about 6:30 pm and left about 90 minutes later. Amnesty, whose researchers spoke to about 23 people and three security officials, said the army command in Geidam had told callers they were aware of the situation and were monitoring. Police in Dapchi promised to tell divisional commanders, while army commanders in Geidam and Damaturu were also alerted during the attack, it added. People in Dapchi have previously said troops were withdrawn from the town earlier this year, leaving only a few police officers. The nearest military detachment was an hour away. The Dapchi abduction has thrown into doubt repeated government and military claims that Boko Haram is on the brink of defeat, after nearly nine years of fighting and at least 20,000 deaths. Boko Haram, which has used kidnapping as a weapon of war during the conflict, has not claimed responsibility but it is believed a faction headed by Abu Mus'ab al-Barnawi is behind it. IS in August 2015 publicly backed Barnawi as the leader of Boko Haram, or Islamic State West Africa Province, over Abubakar Shekau, whose supporters carried out the Chibok abduction. Nigeria Central Bank now says it may hold its first 2018 Monetary Policy Committee in April weeks after a scheduled meeting. The committee failed to hold its first meeting for 2018, after legislatures blocked the approval of new presidential nominees in what appears to be an unfolding political wrangle between the senate and the executive. Activists in Nigeria are seeking to lower the age limit required for political office. Over 1 thousand young people marched to the Presidential Villa looking for President Buhari to sign the bill. Here's more on that story. Nigerian President Muhammadu Buhari vowed Wednesday his government will never give up until the schoolgirls kidnapped by Boko Haram militants go free. "There will be no rest till the last girl, whether from Chibok and (or) Dapchi, is released," Buhari said in a statement, referring to the towns where the terror group has struck in the past four years. The Nigerian leader spoke Wednesday while visiting the Government Girls Science Technical College in Dapchi, a town in Nigeria's Yobe state where Boko Haram abducted 110 schoolgirls in a February 19 raid. It marked his first trip there since last month's attack. In April 2014, Boko Haram sparked international outrage when it kidnapped 276 girls from a boarding school in Chibok, a town in Borno state. More than 100 of these girls remain in captivity, and their whereabouts. In Dapchi, Buhari met Wednesday with families of the missing girls, saying his administration has remained resolute in fighting terrorism and ensuring the students are returned safely. "We have re-equipped our armed forces, security and intelligence services," Buhari said, adding that Nigeria's air force is maintaining aerial surveillance of the area. Buhari said the government was investigating circumstances that led to the girls' abduction and warned that "any agency, person or group found to have been negligent or culpable" would be punished. He said he is confident that all the missing girls will be rescued or released and returned safely to their families. "The government, under my watch, will continue to maintain normalcy and ensure that incidents of this nature are stopped," Buhari said. Bashir Manzo, who attended the meeting, told CNN that he and other parents are anxious but are patiently waiting for the girls' rescue. Manzo's daughter, Fatima, 16, is among the missing. "We want our girls back, but we will give them the time they need to find them," says Manzo, who was elected head of a parents' association for the missing Dapchi schoolgirls. The Nigerian leader last month called the abductions a "national disaster." He has said Nigeria is working with international organizations and negotiators to ensure the girls go free unharmed. "Our resolve (is) to negotiate for the unconditional release of the girls," Buhari said in a statement Wednesday. "Doing so is safer ... and will not endanger the lives of our young girls who are in harm's way," he said. The government last year freed five top Boko Haram commanders in exchange for the release of 82 of the Chibok schoolgirls. Nigerian army spokesman John Agim told CNN last week that one of those freed commanders, Shuibu Moni, would be apprehended again after he taunted the military in a recent propaganda video from the militant Islamic group. Now to Nigeria where one entrepreneur is recycling plastic water sachets into rain coats, school bags and even shoes. He says he is doing his part to fight pollution and encourage reuse and recycling while making a practical fashion statement. There appears to be no let up in the gruesome bloodletting in the Benue-Plateau region in North-central Nigeria, as yet another 25 persons were reportedly killed in the wee hours of Tuesday in an attack on Dundu village in the Kwal District of Bassa Local Government Area of Plateau State. Confirming the attack, the President of Irigwe Development Association (IDA), Hon. Sunday Abdu, said the suspected Fulani herdsmen swooped on the community Monday night and raided it for hours, leaving at least 25 persons dead in the aftermath. While the 25 were being buried in a mass grave in the village, Abdu said the search for bodies was still ongoing since some of the residents who tried to escape the bloody raid were killed in the surrounding bushes and may not have been discovered yet. Also confirming the killings, the state Police Public Relations Officer (PPRO), Mr Tyopev Terna, placed the death toll from the latest attack at 25, adding that his men were drafted to the village to take charge of the situation. But the spokesman of the military Special Task Force (STF) on Security in the state, Major Umar, had initially said eight persons were shot at, adding that seven died on the spot while the eighth victim who was rushed to the hospital eventually died, bringing the fatalities to eight. Umar, however, called back Tuesday to say that the death toll had risen from eight to 21. He also said that when the STF received a distress call concerning the attack, they quickly drafted soldiers to rescue the villagers, but the assailants had fled before they got there. He added that the Dundu terrain was a very difficult one, spanning over 11 kilometres from the village. Rev. Jerry Datim, a local cleric who conducted the mass burial, said the bodies brought for burial were 25, and lamented that the state government had abandoned the villagers to their fate. He was critical of the state governor, Simon Lalong, saying that while the latter was making merry with President Muhammadu Buhari during the president's visit, suspected Fulani raiders were killing more people in the villages. He called on the state government to stop giving false reports on the existing peace in the state when the reverse was the case. Meanwhile, a mass burial for about 10 other persons who were recently slain in Miango village had been slated for Tuesday before the latest killings. Miango is a stone throw from Dundu. Nigeria's presidency said on Monday it plans to negotiate for the release of 110 girls abducted from a school in the northeastern town of Dapchi last month, rather than use a military operation to free them by force. The kidnapping is one of the largest since the jihadist group Boko Haram abducted more than 270 schoolgirls from the northeastern town of Chibok in 2014. Some of the Chibok girls have been freed after what security sources say were ransom payments; around 100 are still being held. Nigeria is grappling with an insurgency by Boko Haram that has killed at least 20,000 people since 2009. Members of the group are suspected of the latest kidnapping, on Feb. 19, in the state of Yobe. President Muhammadu Buhari, a 75-year-old former military ruler, discussed the use of negotiations during a meeting with U.S. Secretary of State Rex Tillerson in the capital, Abuja, the presidency said. "Nigeria prefers to have schoolgirls abducted by Boko Haram from Chibok and Dapchi back alive, and that is why it has chosen negotiation, rather than a military option," Buhari's office said in an emailed statement issued by the president's spokesman. "President Buhari added that Nigeria was working in concert with international organizations and negotiators, to ensure that the girls were released unharmed by their captors," the presidency statement said. The issue of security has become politically charged in Nigeria less than a year before a presidential election. Buhari is touring areas hit by security problems and this week will visit the state where the schoolgirls were abducted, the statement said. Tillerson was in Nigeria for the last stop in a week-long tour of African countries, his first trip to the continent as Secretary of State, during which he has emphasized security partnerships. He visited Ethiopia, Kenya, Djibouti and Chad before arriving in Nigeria's capital. The emailed statement also said Buhari thanked the U.S. for assistance rendered in the fight against Boko Haram, noting that Nigerian forces are good but need assistance with training and equipment. Nigeria needs to change its strategy if it wants to keep benefiting from its crude exports. That's according to an international energy sector analyst. The country lost its top market, the United States, in 2015, after the U.S. began shale production. But all is not lost for one of Africa's top oil producers. To Nigeria's North Central state of Benue, where dozens are feared dead in fresh clashes between farmers and Fulani herdsmen. The state government has now ordered a mass burial of victims coming Friday. Liberia's new president, George Weah, has thrown his support behind Nigeria for the upcoming World Cup. Weah is himself one of African football's most fanous names. He's predicting the Super Eagles will do well. It's been about four months since Nigeria's President Muhammadu Buhari presented the country's national budget to lawmakers in parliament. The Nigerian government had said it was returning to the January to December budget cycle. But so far, the budget has not been approved by parliament. Nigeria's 2017 budget was never passed until about six months into the year and it's now looking like the 2018 budget may suffer the same fate. While African nations have made great strides in the fight against HIV and AIDS, stigma is still a major problem in some areas. One charity in Nigeria is educating young people about HIV in a bid to curb prejudicial behaviour. Former Super Eagles and Eintracht Frankfurt midfielder, Austin Jay-Jay Okocha has been named as one of the German Bundesliga legends as confirmed on the German league's official website. The Nigerian joins Ghana legend and CAF deputy general secretary, Anthony Baffoe, in the 11-man legends network that will be flying the Bundesliga flag across the world. 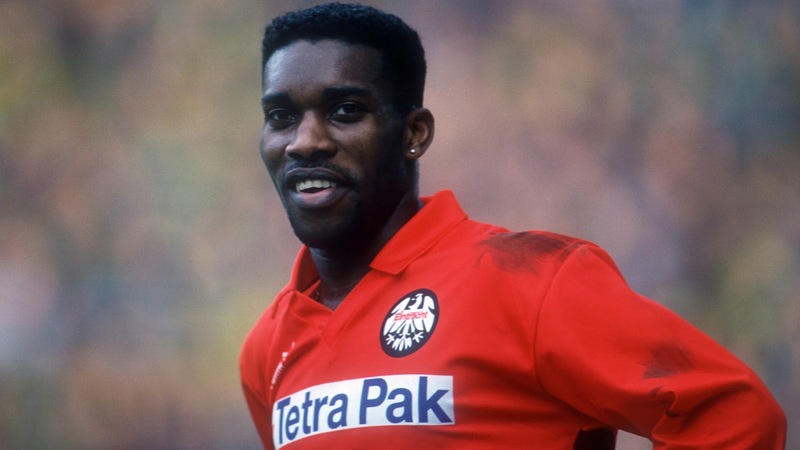 "His sublime skills and tremendous tricks brought joy to fans of Eintracht Frankfurt and lit up Germany's top division for many years, and now it has been announced that footballing icon Jay-Jay Okocha is the latest star to join the Bundesliga Legends Network. "The newest member of an elite group of former playing greats to become part of the illustrious Bundesliga Legends Network, Okocha set Germany's playing fields alight between 1992 and '96 when the Nigerian ace scored 18 goals and provided 13 assists in 90 memorable matches for the team known as The Eagles. 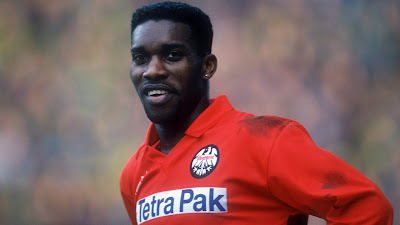 "Never to be forgotten among the sides he has represented, it is with warmth and delight that this footballing artist is remembered among the denizens of Eintracht while followers of the Bundesliga will forever continue to delight in the legend that is Jay-Jay Okocha. Welcome to the Bundesliga Legends Network," a Bundesliga statement reads. The Bundesliga was bewildered by the quick feet, spellbinding step-overs, dream-like dribbles and eye-catching creativity of one of the developing stars, and characters, of the world game. On August 31, 1993, Okocha combined all of the above traits to score one sensational goal that had beaten goalkeeper Oliver Kahn tweeting over 20 years later, "I'm still dizzy," even now. Bundesliga giant Kahn entered folkloric status at Bayern Munich, but it was while at Karlsruhe that the highly decorated shot-stopper faced his Nigerian nemesis on a night when he, and several defenders, were left with a sense of motion sickness following Okocha's jaw-dropping exploits. Following his spell in Germany, the attacking midfielder took his skills to Turkish team Fenerbahce, Paris Saint-German and Bolton Wanderers, among others. Speaking at the school’s opening ceremony which was attended by the Kano State Governor Abdullahi Umar Ganduje, Dangote told guests that the school was part of his contributions towards driving entrepreneurship education at the highest level in Nigeria. The Dangote Business School has been accredited by the National Universities Commission (NUC), and will be first business school in Nigeria to offer the Doctor of Business Administration (PhD) programme in the country. Dangote also disclosed that talks are ongoing to develop strategic partnerships between the Dangote Business School and the Harvard Business School in the U.S.
’My interest for supporting higher education in Nigeria stems from the belief that we can and we should provide the same quality of education here in Nigeria like anywhere else in the world. Good quality education is fundamental in breeding a vibrant economy and society. My goal for this business school is for it to become a reference point when it comes to learning how to do business successfully in Nigeria and in Africa. 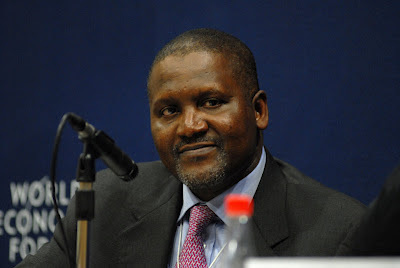 This means that this business school should carry out studies and researches that are specific to our needs and ways of doing business which would allow more information to be shared globally on how Africans can do business,” Dangote said at the ceremony. Nigeria's government has set up a commission of inquiry into the mass abduction of the Dapchi schoolgirls. It's the biggest kidnapping since Chibok in 2014. CGTN's Kelechi Eme-kalam spoke to the strategist of the Bring Back Our Girls campaign, on how best to secure schools in the volatile area of north-eastern Nigeria. Suspected Boko Haram militants killed at least 11 people including three aid workers in an attack on a military facility in Nigeria’s northeastern Borno state late on Thursday, according to two security reports seen by Reuters. The raid in the town of Rann marks the latest high-profile attack by militants in the northeast, coming less than two weeks after militants abducted 110 girls from a school in the town of Dapchi in neighboring Yobe state. The United Nations confirmed three aid workers, all Nigerian nationals, were killed in the attack in Rann, near the Cameroon border, and said a female nurse was missing, feared abducted. It said it was also concerned other civilians may have been killed or injured. Four soldiers and four police officers were also killed, according to the Nigerian security reports seen by Reuters. The militants, armed with rocket-propelled grenades and truck-mounted guns, initially overpowered soldiers in a firefight at the military facility but the armed forces later regained control, according to the two reports. The attack is a further setback for President Muhammadu Buhari, who took office in May 2015 vowing to improve security and who has repeatedly said the Boko Haram insurgency has been defeated. The government said on Friday that it was extending to neighboring countries the search for the girls taken in Dapchi, which is some 400 km (250 miles) west of Rann. Borno state, where Rann is situated, is the epicenter of the Boko Haram insurgency, which aims to impose a strict interpretation of Islam in northeast Nigeria. More than 20,000 people have been killed and some two million forced to leave their homes since 2009. Two of the aid workers who died were contractors with the International Organization for Migration, working as coordinators at a camp for 55,000 displaced people in Rann, the United Nations said. The third was a doctor employed as a consultant for UNICEF. “We call on authorities to ensure the perpetrators are brought to justice and account,” Edward Kallon, the U.N. Humanitarian Coordinator in Nigeria, said in a statement. Mohammed Abdiker, of the U.N. International Organization for Migration, said staff were“outraged and saddened” by the death of their colleagues. Attacks on aid workers are rare, but not unheard of. In December, four people were killed when a World Food Program (WFP) convoy was ambushed in Borno state. Boko Haram held a swathe of territory in northeast Nigeria around the size of Belgium in late 2014. It was pushed out of most of that land by Nigeria’s army, backed by troops from neighboring countries, in early 2015. Although it has failed to control large areas of land since then, the group continues to carry out suicide bombings and gun raids in northeast Nigeria, Cameroon, Niger and Chad. The camp for displaced people in Rann was bombed in an accidental Nigerian Air Force strike last year, killing up to 170 people. Although it's endemic to the country, Lassa fever numbers have never reached this proportion before, according to the WHO. Nigeria's Centre for Disease Control said Wednesday that it was facing an "unprecedented outbreak" that has spread to 18 states since it began in January. The disease can cause fever and hemorrhaging of various parts of the body -- including the eyes and nose -- and can be spread through contact with an infected rat. "The ability to rapidly detect cases of infection in the community and refer them early for treatment improves patients' chances of survival and is critical to this response," said Dr. Wondimagegnehu Alemu, the WHO representative to Nigeria. "Given the large number of states affected, many people will seek treatment in health facilities that are not appropriately prepared to care for Lassa fever," Alemu said. "The risk of infection to health care workers is likely to increase." Nigerians, especially in those three states, should "continue focusing on prevention by ensuring they prevent access to their foodstuff by rodents," Ihekweazu said. There is risk of the virus spreading to other West African countries due to increased migration, said Dr. Oyewale Tomori, professor of virology at Redeemer's University in Nigeria and the former regional virologist for the WHO's Africa Region. "There is always cause for alarm in West Africa, where the rodent host of can be found in virtually all countries of West Africa," he said. A painting by the renowned Nigerian artist Ben Enwonwu that had been missing for decades, has sold for record 1.6 million dollars, at an auction in London. Enwonwu's 1974 classic painting of the Ife princess Adetutu Ademiluyi, known as Tutu, is widely celebrated in Nigeria, with reproduction posters found in many homes. Three were painted in the early 1970s and famously disappeared in an art world mystery that is until one was discovered in a very ordinary London apartment late last year.